Why don't you just use your cell phone? Just seems like an alarm clock is just another item to collect dust and not work if power is interrupted. Plus with a phone you can wake up to anything you want. Currently I wake up to theme song from Narcos. I don't think my phone has been charged for three days now. I don't have phone reception at work, so it's somewhat rare I use it anymore. It's funny that this alarm clock issue came up. 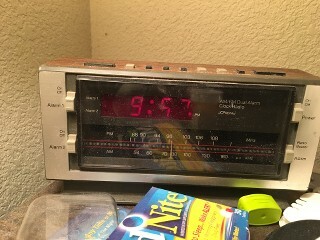 Just last night, before bed, I finally took a picture of my alarm clock because I knew mine is on its last legs. The last time we had a power outage, I tried resetting it and, as I did, some of the button membranes under the physical buttons must have finally broke so I can't reset it any more. So the next power outage we have, it's toast. Unless, the power goes out at midnight or noon! This baby I received for Christmas when I was probably 9 or so? My sister received a stereo. Both of us were so thrilled looking at these and checking them out that we both failed to notice the Intellivision by the fireplace that Santa had left. We've got photos of both of us, completely oblivious to the video game system just sitting there while we fiddle with these new fangled clocks and stereos. And then there is a photo of our reactions when we saw the Intellivision. I was such a goober, just staring in awe-filled wonder with huge eyes and this grin of unbelievability on my face. Priceless. If you notice, half the LED numbers don't even light anymore, so over the years I've had to learn "Clock-Radio-Ese," the language of old, dying clock radios. Got my face ripped off today because the person thought we did the balloons for their company event and it sucked. Tried to tell them we didn't do anything like that today and it must be someone else. She refused to believe me. Then she called back about half an hour later and said it wasn't us and how much would it be for us to fix it? No apology for dressing me down for 15 minutes for something we didn't do or anything. So I told her how much and got another earful for being more expensive than the people who screwed it up. It wasn't even that much more and we'd have to have dropped everything to do it right away. Then I got another earful when I told her we won't just go there and try to fix their mess for less. I love when you give a quote to someone and they get mad at you. Let me guess, she was from the North side? Sounds exactly like a couple people I know. It is fascinating when someone is convinced something is true that can easily be proven wrong. Like you wouldn't know that was your customer? Weird, but like I said- definitely know the type. Our line is we're not cheap, we're easy. I think anybody who works in a specialty shop get that fairly often. I know we laugh about it with the hardware people down the street on occasion. They get it all the time. It usually doesn't bother me but on occasion they are just so blind about it. I kind of felt like saying "hey give me a break we can fail at that price too." But that would be counterproductive. Hey I'm a north sider. Honestly don't know where they are located. I've never been there. So I told her how much and got another earful for being more expensive than the people who screwed it up. It wasn't even that much more and we'd have to have dropped everything to do it right away. Then I got another earful when I told her we won't just go there and try to fix their mess for less. This is a behavioral heuristic called "anchoring", which is that a person's first exposure to something becomes their "measuring stick" for how they evaluate everything else that is similar/in that category. Their first exposure was cheaper than you, thus that becomes their measuring stick. It's kind of the opposite of if your first exposure to a car is the beat up old Oldsmobuick that your parents/grandparents have, and then you go off to college and a friend from suburban Chicago pulls up in an 8-year old BMW 3-series. The BMW isn't anything special for a BMW, but compared the the Oldsmobuicks you grew up in, it's pretty awesome. Update. The lady called back and apologized. She was sincere and said she was under a lot of stress and took it out on me which was wrong of her. She then thanked me for being so patient and will definitely use us for any future events. So glad I didn't say all the things I was thinking of saying to her. I have a convenient grocery store across the street so I go over there at least every other day if not more. There is crosswalk that has one of those nifty pedestrian signals that gives you a countdown until the traffic signal will change. The problem is it only works if someone actually pushes the button, mind you it doesn't change any timers on the traffic signal as it is bottleneck area so all the lights are on timers or there will be major traffic problems. So if you approach when there are red lights but if no one has pushed the button you can either take your chances, in which case it the light will turn green when you are halfway across, or you can wait and after about 30 seconds you realize you could have made it and now have to wait with arms full of groceries for another 3-4 minutes under the sweltering ******* sun. Meanwhile the light on the next block down gives you the walk signal and countdown every time whether someone pushes the button or not. It's stupid. The chip in my most frequently used credit card keeps wearing out and it needs constant replacing. The current card I have is only about 4 months old and I'm already getting "Chip Malfunction" errors on a lot of card readers. I get that they are more secure, but I never had this problem with the magnet strips. Mine has been doing it as well, but you are right, it's only certain locations. Still annoying. I get weird looks and then have to ask if I can just use the strip. It does work at some places, but not others. The reason I think it's the card is I can often switch cards and the second one works just fine. I wish more places/cards used the tap feature so I don't even have to use the chip reader. If you're in the market for a new alarm clock, I bought this one a few years ago and I love it. On the pricey side for an alarm clock but the features are worth it. Time sets itself, auto adjusts for daylight savings, projects time onto a wall or ceiling so you don't have to roll over to see the time, 10 minute snooze, gradual wake alarm starts slow/quiet and increases volume gradually, 3 brightness settings plus you can even turn the display off completely. And it has a USB port so you can use it to charge your phone. Those are just the features I personally care about, there's others. My only complaint is the time runs a little fast, it's about 5 minutes fast after 3 years. It doesn't bother me too much because I can factor that in and I'd rather it was fast than slow. I never thought I would, but I love projection clocks. We have a La Crosse weather station in our bedroom that projects the time, outdoor temperature, or both alternating, and I hope it never dies because La Crosse doesn't make that model anymore. Having said that, I'm a little tempted by the Sony model SeaBass posted. I'm more of a clock + radio person, though. And I always want to be awakened by the radio rather than a blaring alarm or nature sounds. Edit: Haha, my bad, it does have a radio. I'm intrigued. We'll see. Thanks for the tip, SeaBass! I wish every place took Apple Pay, as I appreciate the safety and speed. I believe Android Pay works the same way with tokenization. When you call your bank, cell phone company, cable company, etc and before you speak to someone they ask you to verify your name, account, pin, etc. Then, when someone finally comes on the line they ask you to verify yourself and your account again. Better yet, having to listen to the stupid prompts to make your selection(s). Build the options into the app and let people select what they are calling about before dialing the phone. Yes! Pay for a computer system that's fast enough to transfer the information! What annoys the crap out of me is getting a call from bank/Credit card company asking you to call about some suspicious activity. They give you a number. You call the number. Go through all the directory tree and finally get a human (because they don't have a menu option that pertains to fraud alerts) and the human says "how may I help you?". YOU CALLED ME!!!!! ISNT IT IN MY RECORDS? They take the info and inform you they need to transfer you to the fraud prevention group.... Why doesn't the Bleeping fraud prevention group have a direct number! WHY? WHY? WHY? TOO SIMPLE?